2 bedrooms, 1 bathroom, swimming pool, air conditioning, wi fi, parking, bbq. Located in one of the richest areas of Sicily, famous for its fine wines and its crystalline sea, Villa Alicante is the perfect choice for those who want to spend a holiday of absolute relax and contact with uncontaminated nature. The landscapes of this area will capture your senses and leave an indelible mark in your memories: the vineyards that stretch out from the hills and reach the sea; the long beaches with the sandy dunes and the sea that have won the prestigious award of 5 Blue Sails for the environment many times; the wonderful Valley of the temples; the ancient Sicilian wine cellars opened to visitors who want to discover the ancient and fascinating "art" of wine. This and more is what you will experience by choosing Villa Alicante, consisting of two bedrooms both air-conditioned, a comfortable living room kitchen equipped with dishwasher, a bathroom with shower, a large veranda furnished with table, chairs and a comfortable lounge and laundry. The villa is surrounded by a beautiful Mediterranean garden in the middle of which there is a swimming pool furnished with comfortable deckchairs and sun loungers where our guests can relax and enjoy the sounds and the smell of the surrounding nature. The outdoor areas dedicated to our guests are all well-cared: the relaxation corner with hammock, the corner of the "aperitifs" where you can sip a glass of excellent local wines at sunset, the barbecue corner and finally for children (but also for adults!) the play area, with swings and other entertainment. The villa also has a private parking in the shade of a pergola, a Wi-Fi connection and a comfortable outdoor shower. 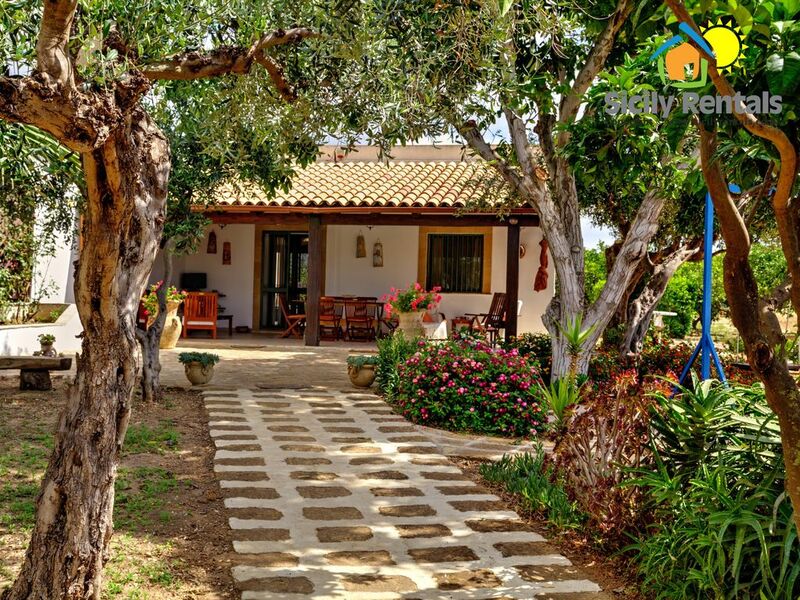 Villa Alicante is therefore the ideal choice for your holidays! Between the area of the temples of Selinunte and the archaeological excavations of Eraclea Minoa Menfi rises up, a town near Agrigento famous for the production of wine and its sandy coast that stretches for about 10 kilometers and which is characterized by the natural sandy dunes. Thanks to the quality of its beaches, the town has been honoured with the awards of Blue Flag and Green Flag for several years! The excellence of the Menfitano wine gave birth to Inycon in 1996, an event that takes place every year on a weekend in June to promote the main product of the economy of this town. The event, in addition to the celebration of the territory from the point of view of wine, provides theater performances, live concerts, conferences and fireworks. By tradition, Peppe Nappa, the mask symbol of Sciacca Carnival, opens the celebrations by giving out sweets, sausages and wine to everybody.